What Are The Top Gifts For The Techie On Your Christmas List? 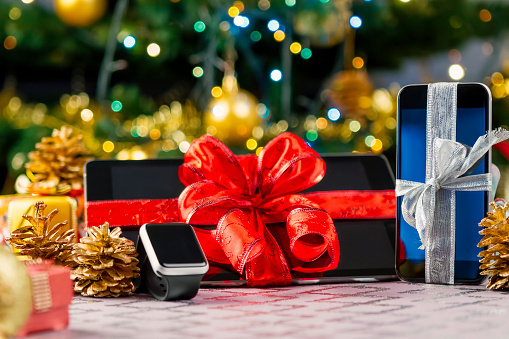 What Are The Top Gifts For The Techie On Your Christmas List? What Are The Top Gifts For The Techie On Your Christmas List? New tech can be fun and fascinating, but most importantly it solves a need in a person’s life. If you’re trying to choose a Christmas gift for the techie in your life, consider the little problems they’ve been commenting about. Solve that problem with a new piece of technology and you’ll find an innovative holiday gift that won’t be quickly forgotten. Fitness buffs are fascinated with recording results and improving their game. The new Fitbit Charge 3 will help them to do just that. This advanced fitness tracker includes a 24/7 heart rate monitor, a smart touchscreen, goal-based exercise modes, and smartphone notifications. Getting fit isn’t just about working out; eating right is also an important component. The Greater Goods Digital Food Scale will not only weigh food servings, but it also tells nutritional information for 2,000 built-in foods, tracks daily macro totals like fats, carbs, and calories, and adapts to your personal diet. For the most personal gift of all, give her the Muhdo genetic profiling kit. Once the profile has been done, Muhdo will do DNA testing and devise an artisan fitness and nutrition plan based on her personal genetic markers. Time seems increasingly short for both executives and independent business owners, so anything that increases productivity will improve both their bottom line and their attitude. With the Equil Smartpen 2, he can doodle, sketch, or take notes on any piece of paper that’s handy, then transfer it into digital form via the pen. If keeping track of keys or other objects is slowing down mornings, he’ll appreciate TrackR Stickers. They affix to any flat surface and will beep when activated by a smartphone app. Is lack of attention slowing her down in boring meetings? The Fidgi Pen has enough stealth fidget points to keep anyone alert during the latest budget overview. For anyone who spends massive amounts of time working elaborate programs, the Packed Pixels Multi Laptop Windows is a multi-window attachment for his laptop that turns it into a computer with three monitors. Photography is a growing hobby, and manufacturers have come up with a wide variety of great devices for both amateurs and professionals, alike. For the most casual user, the Amir Clip-On Smartphone Lens will turn any basic iPhone into a high-quality camera. He’ll shoot close-ups, wide angle shots, and super-clear portraits with this easily-attached lens collection. The FujiFilm Instax Minicamera is the hottest instant around in a generation. She can toss it in the office for impromptu group photos, or use it on road trips for ice-breaking sessions. For executives who unwind by going to the extremes, the Polaroid Cube+ is the ideal lifestyle action camera. He can attach it to a helmet, handlebars, a surfboard, or any other piece of sports equipment. For the more casual adventure photographer who never seems to remember a tripod, the Poying Bottle Mount will save the day. He can attach the mount to the bottom of any small camera, then screw the mount onto any commercial bottle of water. Instant tripod! Being at home should be as relaxing as possible, and these tech gifts make sure that happens. The iRobot Roomba automatically vacuums the floor by rolling around the house picking up dirt, then moves back to it’s home to charge up for the next trip. The NEST Hello doorbell’s ultra-clear camera shows everything that happens on your front porch. It’s 24/7 streaming HD video that’s always on, streaming both to your smartphone and straight to the cloud for safety. The Echo Plus smart home hub connects all your Internet of Things to form one intelligent, connected unit she can run from voice commands or a smartphone. And the VicTsing Bluetooth waterproof shower speaker adds incredible stereo sound for both invigorating morning showers and relaxing evening baths. Everyone needs to have a little fun in their life, no matter how driven they are to succeed. New tech products make it easy to find new hobbies and enjoy small bits of free time throughout the day. Apple Airpods give excellent stereo sound in a wireless design. Airpods are always attached to Siri, to make your life even easier. The Retroduck Retro iPhone Dock turns your iPhone into a 60’s-style television that sits on your desk. It includes a stand and a trio of rabbit-ear antennas to complete the look. The Urban Outfitters Folding Massage Chair reminds you of aluminum lawn chairs on your grandparents’ lawn, but with a considerable upgrade. Your gift recipient will love the deep-tissue massage with three pressure settings and four massage modes.